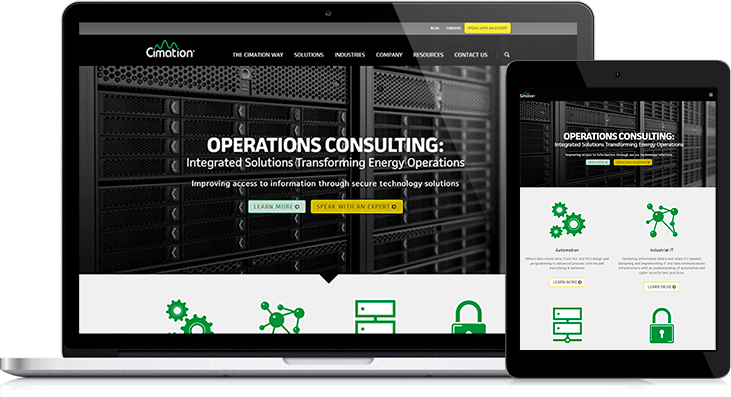 Cimation is an engineering and consulting firm, primarily working for the energy industry. Their service offerings range from automation to cyber security and training. On the cutting edge of technology for the energy industry, they are constantly releasing vital resources and updates as part of their marketing strategy. The marketing team at Cimation was interested in overhauling their web presence, improving upon templates that were difficult to edit and resolving key SEO issues – all while putting together a great user experience. They needed a partner that could set up a new website with cutting-edge design and integrate with HubSpot. Cimation is happy to have an overhauled web presence that employees, partners and clients can be proud to visit. With hands-on training and full documentation, the marketing team is able to keep the website content fresh and maintain it without a developer. I need a redesign. Let's do this!